Here you can find some frequently asked questions about piano lessons and the piano in general. In case a question remains unanswered, please contact me here. On which days do you teach? There are no lessons on public holidays and during all Viennese school holidays (Christmas, semester break, Easter, Whitsuntide, Summer). During the months of July and August lesson times for summer subscriptions will be distributed individually. Where do piano lessons take place? Piano lessons take place in my private studio at Seidengasse 44/18, 1070 Vienna. In a nicely decorated room with a pleasant and cozy atmosphere we have a beautiful Yamaha C7 grand piano with new strings and new Bechstein hammers at our disposal. With a considerable length of 220 cm it offers outstanding sound, an impressive bass, unparalleled dynamic range and allows for a wide range of expressive possibilities and subtle playing that meets the highest demands. Do you also make house calls? At the present time my teaching schedule is fully booked therefore I’m not able to come teach at your home. If something opens up an additional fee of € 20,- will be charged for a house call. How long does a piano lesson last? You can choose your lesson time between 30 min, 50 min or 2 x 30 min. For adults I generally recommend 50 minutes. For younger children (age 4-7) 30 minutes are mostly sufficient as concentration will wane after that period of time. 30 minutes twice a week is the best possible way whereas 50 minutes would be appropriate only in certain cases. When children advance quickly it makes sense to upgrade to 50 minutes or to the aforementioned 30 minutes twice a week. Advanced students regardless of their age are well-advised with 50 minutes or 30 minutes twice a week. I already play from music books or lead sheets, should I bring them? Be sure to bring all the music books, sheet music, lead sheets etc… that you’re currently working on or that you’re interested in. This ensures a seamless transition from your previous lessons and you get an idea of my teaching methods. Which piano method or which sheet music should I buy? You do not need to buy anything for the first lesson, if necessary I’ll recommend a suitable piano method book for each student individually. To save you time and research, I always offer to buy the necessary materials at a local music store and then pass them on for the same price. In general, every student who also learns reading music from books requires between 2 and 4 books per year. The costs are not included in the price for piano lessons, but with about 15-25 Euros per book they are not terribly expensive. How often do I have to tune a piano? 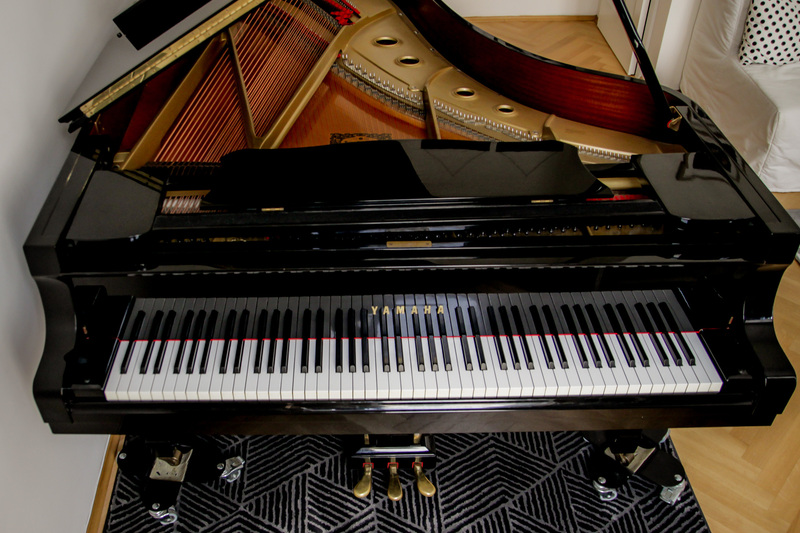 Your piano should be tuned at least once a year, better even twice a year. A piano’s tuning stability is especially affected by changes in humidity and temperature. By keeping your piano in tune you not only refine your hearing, but also extend the life of your instrument. Do you organize Recitals and Performances? In general a piano recital is held once a year, however when I can’t bring together enough students it might not always take place. Alternatively students can perform at piano recitals at my music school in Lower Austria as guests. These recitals are held 2-3 times a year usually on a Wednesday. Although it is more time-consuming to get there (Ebenfurth/Zillingdorf, about 40 km from Vienna), I recommend participating for the benefit of musical development. I’m offering a trial lesson to get to know each other. It costs € 20,- and lasts about 50 minutes. In this first piano lesson you can get an idea about my teaching methods, we’ll find out your current level, work on current pieces or try to find out personal preferences and interests. How much does a piano lesson cost? Piano lessons are available as individual private lessons for € 30,- (30 min) or € 45,- (50 min) charged by the unit. For a semester subscription the cost for a minimum of 16 lessons is € 375,- (30 min/week) and € 575,- (50 min per week or 2 x 30 min/week). You can also book a trial lesson, which costs € 20,- (50 min). This amount will be credited when enrolling for at least a whole semester. A list of costs can be found here. I offer average prices in Vienna, which means that depending on the training and experience of a piano teacher, you sometimes pay a little more or less. I have completed two instrumental pedagogical studies at the Music University of Vienna and are constantly taking part in further music pedagogical trainings to broaden my horizons and to get to know new developments in piano pedagogy. At what age can my child start with piano lessons? A good age to start taking piano lessons is 6 years for most children. In this case, it may be possible to start as early as age four. However, you should bear in mind that active help of one parent Is absolutely necessary. In other words, you as a parent need to be present at the piano lesson, follow every task, game and movement so that you will be able to reconstruct everything accurately at home together with your child. Audio or video recording during the lesson is also highly recommended. What lesson length should I choose for my child? Although this can often be determined by organizational or financial circumstances, a child (4-10 years) benefits most from 30 minutes twice a week! You’ll probably wonder why this lesson length with a total of 60 minutes isn’t more expensive than the one with 50 minutes once a week. It’s quite simple: a higher lesson frequency (twice a week instead of once) with shorter duration generally yields faster progress and usually leads to more motivation and joy, this I’d like to support wholeheartedly. Experience also shows that more frequent lessons and shorter Intervals in between lessons are highly beneficial for children. Besides, few younger children have an attention span required for a full 50-minutes-unit. A semester subscription is often the basis for successful instrumental lessons due to its commitment and continuity. This is especially important for beginners of all ages. Due to its continuity and regularity piano playing is more easily integrated into children’s school life who nowadays are already juggling multiple extracurricular activities. Piano lessons are built up from week to week and are tailored to individual learning tempo while building step by step the stations of your personal musical journey. Piano lessons are built up from week to week and are tailored to individual learning tempo while building step by step the stations of your personal musical journey. Due to its continuity and regularity piano playing is more easily integrated into an adult’s everyday life for whom it is usually a huge challenge to juggle work and/or family next to other activities such as music. Those who set their priorities will have more joy and success in the long term and weekly lessons support this goal enormously. What is a Swap List? The Swap List offers a possibility for semester subscribed students to swap their lesson time with someone else on the list. Students/parents who want to be part of the Swap List have to give their consent to share their phone number and E-mail with other students/parents of my piano class. Being part of the Swap List is voluntary and could help to accommodate occasional unavoidable changes in student’s schedules. Students that are not part of the Swap List will never be contacted by other students for lesson swapping, but in turn won’t be able to swap lessons themselves, should the need arise. Members of the Swap List will receive my current lesson schedule and can try to swap lessons if a regular lesson cannot be attended. Organisation happens among students/parents, if you have made a swap, please let me know so I can plan accordingly. Can I come to a piano lesson that someone else cancelled? When a student cancels a piano lesson, that lesson becomes available spontaneously. Since it’s a slot during my regular teaching time, it can be filled by another student. When this occurs I usually contact a student who has recently missed a piano lesson and offer it to them. If they cannot take the lesson at such short notice, I just ask the next one on my student list etc. Sometimes with a bit of luck one gets to have a makeup lesson after all. Am I entitled to a makeup lesson if the teacher cancels my piano lesson? In general no makeup lessons will be given If I have to cancel your piano lesson as part of a semester subscription, but I guarantee a minimum of 16 units per semester. A semester consists of 17-18 units on average, which would allow me to cancel 1-2 times due to illness or an artistic engagement. If you don’t reach your minimum of 16 lessons because of my cancellation, the missing units will be made up or credited. Individual private lessons, trial lessons as well as the units of a summer subscription are generally made up when cancelled by me. You can also read about the cancellation policy of piano lessons in my studio policy. Can I reschedule my piano lesson? It is not possible to reschedule your piano lesson when you have booked and reserved your spot for a whole semester. If you miss your lesson for any reason whatsoever it will not be refunded or madeup. For individual private lessons, trial lessons and summer subscriptions it is possible to reschedule. In this case please give notice at least 48 hours in advance, otherwise the unit expires and must be paid. Because I teach a lot and I’m also an active musician I do not have the capacity to reschedule someone’s lesson to a new time slot outside my regular teaching schedule. For this reason, even in case of sudden illness there is no refund possible. Please also read my Studio Policy for more information. I have to cancel my piano lesson, when can we do a makeup lesson? Cancelled piano lessons as part of a semester subscription can neither be refunded nor credited nor madeup, regardless if it’s due to illness, private, professional or school commitments or because of holidays etc. However, there is a so-called “swap list“, which allows students to swap their lesson-slot with someone else at short notice. This is done among students/parents, if you know that you cannot visit your lesseon at your regular time, you may find someone to swap.